By Antonoplos & Associates | 18 January, 2019 | no comments. Washington, D.C. Peter Antonoplos hosts a seminar for government workers to discuss tips for surviving the government shutdown. 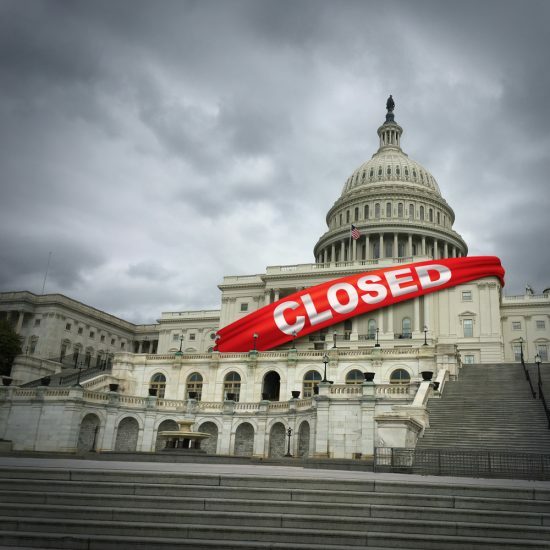 Recently the Federal Reserve Board reported that nearly 4 in 10 Americans are unable to cover a $400 unexpected expense, which means that a number of furloughed federal employees have likely used up all of their cash reserves in order to stay afloat. To make matters worse not all impacted workers can count on retroactive pay after the shutdown. The road to financial recovery may be very long, for some. In an effort to assist those effected by the shutdown, Antonoplos & Associates hosted a seminar on surviving the government shutdown. Contact Creditors* Waste no time reaching out to all of the creditors you owe before payments are missed – credit cards, car loans, mortgages, etc. Although the Office of Personnel Management provided access to sample letters, a more personal approach to this critical step can be helpful. Tell your story to the creditors. Identify your critical expenses and look for areas you may be able to reduce spending like cable or internet services. Think about services you use, but do not need such as music or movie subscriptions, subscription boxes, genealogy services and more. Also think about ways in which you may be able to increase income during this time. Side jobs or selling unused household items may be an option. Identify Resources in Your Community – Charities, non-profits and commercial businesses are all pitching in to provide a variety of support. To find services in your area, dial 211 or visit 211.org online. ​​​​​​Coast Guard Mutual Assistance – USAA donated 15 million to the Coat Guard Mutual Assistance fund. The donated funds will disburse as interest free loans to Coast Guard personnel with the assistance of the American Red Cross. The loan assistance is available to all Coast Guard servicemembers and is designed to cover an estimated two weeks of financial shortfalls caused by a lack or pay. Members should start by seeking assistance at the Mutual Assistance website. Washington Federal – is offering loans that are interest free for 90 days. You do not have to be a current Washington Federal customer to apply. Bank of America and Chase have established special toll-free hotlines. Bank of America is 1-844-219-0690 and Chase can be reached at 888-356-0023. Bank of America, Chase, Navy Federal Credit Union and Wells Fargo have offered support to federal employees by including fee refunds or waivers, loan modifications and repayment plans. For federal workers who have direct payroll deposit, Wells Fargo will automatically reverse monthly service and overdraft fees. Chase also announced a similar plan. Navy Federal Credit Union is offering 0% interest loans for up to $6,000 with a grace period. Government contractors may also be eligible if they receive their direct deposit from the federal government. U.S. Bank has created a low-rate loan for federal workers impacted by the shut down. The special federal worker phone line is 877.760.6046. Discover clients may be eligible for skipping a payment and having late fees and interest charges reversed if they miss a payment due to the shut down. Discover clients call 800.347.2683. FedChoice Credit Union has several options. Visit their website www.fedchoice.org. Student Loans – Help for those making payments towards their federal student loans is very limited. Visit the Department of Education’s Blog for information on deferments, forbearance options and payments based on income. Cell Phones: Verizon, AT&T and T-Mobile all have special payment programs which include waiving late fees and payment extensions. Call and let them know you are a government worker. Taxes: What we know as of January 15th, is that tax returns and refunds will continue to be processed during the shutdown. IRS employees are working without pay. However, paper returns (as opposed to electronically filed returns) will take a substantial amount of time to be processed. The IRS walk in Taxpayer Assistance centers will not be open during this time. Audit and collection activities will also be greatly reduced.